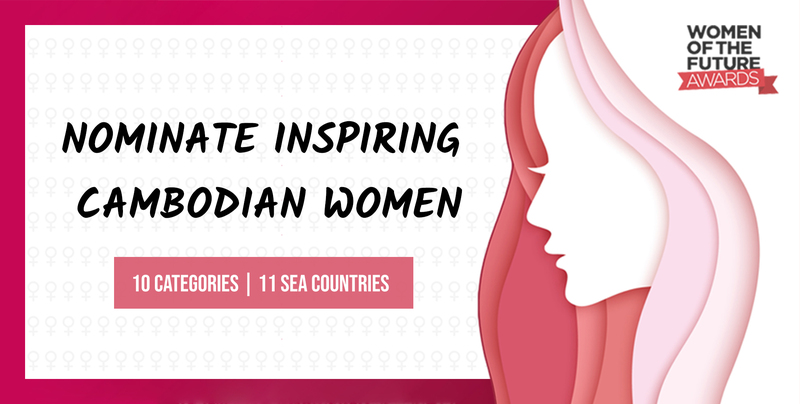 | Nominate Inspiring Cambodian Women! After Cambodia’s outstanding success in 2018′s inaugural Women of the Future Awards, nominations are now open for the 2019 Awards, and Geeks In Cambodia is pleased to support Cambodian Women and see even more leaders nominated in even more categories. In last year’s awards, Cambodia nominated 27 women, of whom 11 where shortlisted and at the Awards Ceremony in Singapore, Cambodian women received 4 awards. The awards will once again aim to build a platform to showcase regional emerging leaders, who are tomorrow’s game-changers, disrupting stereotypes and driving positive impactful change. The Women of the Future programme aims to encourage, motivate and provide role models to inspire and strengthen the female talent pipeline and in the process create a global community of supportive and collaborative women. Nominations will close on October 17, 2018, and five candidates per category will be shortlisted for the 2019 awards. Women in Business Cambodia committee members are available to assist with applications and professional business English if required.